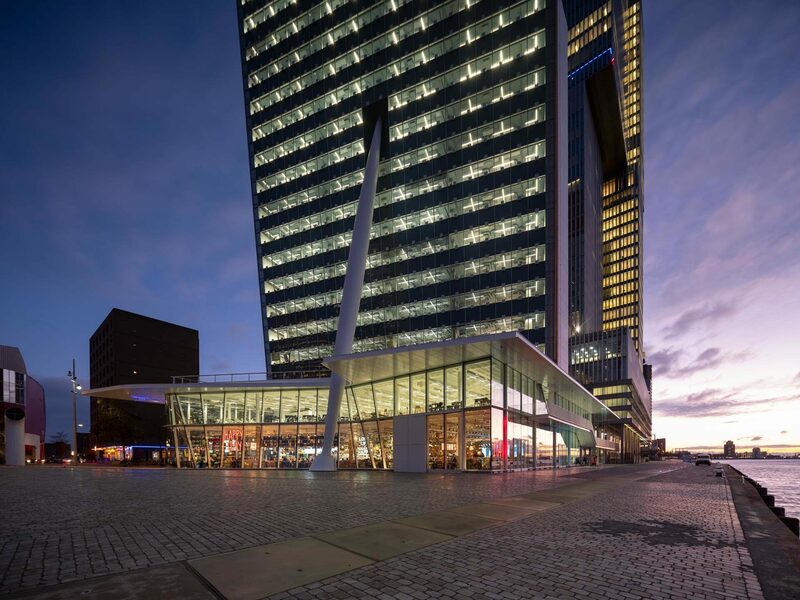 The renovation and modernization of KPN’s headquarters in Rotterdam has been completed. The striking tower at the bottom of the Erasmus Bridge on the Kop van Zuid will be named The Link, a reference to the connection that is central to KPN’s services. A glass terminal of 2,800 m2 has been added to the existing building of approximately 18,500 m2, which was designed by architect Renzo Piano. The extension includes an auditorium for 250 people, several meeting rooms, a company restaurant, a KPN shop and a restaurant of the Happy Italy chain that is accessible to the public. The LED pixel facade has also been renewed and is now in full color and available for communications by the City of Rotterdam, events, and video art. Real I.S. owns the building that houses KPN’s headquarters, which will be officially opened on November 26. V8 Architects designed the extension and redevelopment. Savills was in charge of technical project management for the renovation and Dura Vermeer carried out the construction work.